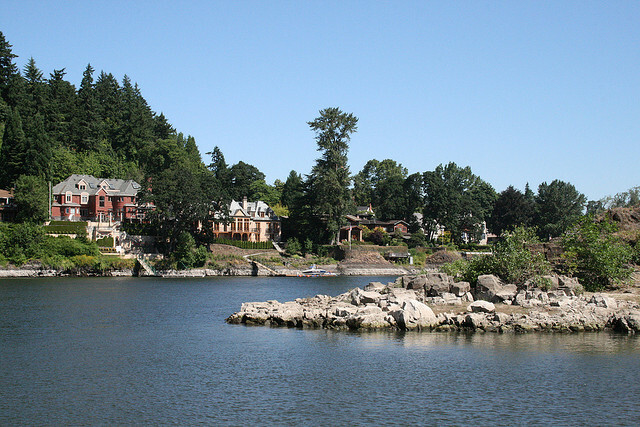 Portland‘s Dunthorpe neighborhood is located just north of Lake Oswego to thee of forest Highlands Park and the west of the Willamette River itself. Dunthorpe is known for its grand luxury homes and is one of the most affluent subdivisions in Portland Oregon. It’s located just north of the Multnomah County line and provides easy access to Lake Oswego, Lewis and Clark College and downtown Portland. The Dunthorpe neighborhood is also home to the elk rock gardens of the bishops close which is over 6 acres of English style gardens open to the public seven days a week. It displays many varieties of magnolias and other native and exotic plants. This was originated and designed by Olmsted and Son who also designed New York’s Central Park. Many of the homes and estates in this area have beautiful views of the river and frequently watch the planes take off from Wiley’s port. It’s one of the most expensive an exclusive communities and all of Portland. Known for one of the better school districts in the area, Dunthorpe offers a safe community with easy access to downtown Portland. It’s a great walking area with a running track at the college and home to several professional basketball players, coaches, doctors and business owners.